New Delhi: Air Marshal Birender Singh Dhanoa, PVSM AVSM YSM VM ADC, will takeover as Chief of Air Staff on 31 December 2016, on retirement of Air Chief Marshal Arup Raha, PVSM AVSM VM ADC. 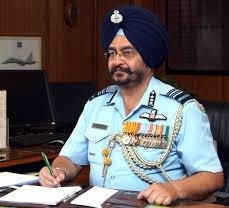 Air Marshal BS Dhanoa will be the 25th Chief of the IAF since independence. The appointment was formally announced on 17 December. Air Marshal BS Dhanoa took over as the Vice Chief of the Air Staff (VCAS) on 01 June 2015. He was commissioned in the IAF in June 1978 as a fighter pilot. He is an alumnus of Rashtriya Indian Military College, the National Defence Academy and the Defence Services Staff College, Wellington. The Air Marshal has mainly flown the Kiran and MiG-21 aircraft with flying experience across the entire spectrum of fighter aircraft from the Jaguar to the state of the art MiG-29 & Su-30 MKI, with an immaculate record of flight safety throughout his distinguished career as a field commander. The Air Marshal has many feathers in his cap. As Commanding Officer of a front line ground attack fighter squadron, he led the IAF punch during the ‘Limited War’ against Pakistan to evict the enemy from their ‘dug in’ defences in the icy heights of Kargil region. During the conflict, under his leadership and supervision, the squadron devised unique and innovative methods of bombing in the night at altitudes never before attempted in the history of Air Warfare. While prior to the war, the squadron, for its high degree of professionalism and peace time training had been adjudged as the best fighter squadron of HQ WAC, post the conflict it emerged as the most decorated IAF unit of Kargil War. The Air Marshal himself was awarded Vayu Sena Medal for his exceptional devotion to duty prior to the war and the coveted Yudh Seva Medal post war for his outstanding bravery and leadership during the conflict, both in the year 1999. His command tenure of a Forward (Fighter) Base Support Unit was equally illustrious with the base being adjudged as the best in maintenance despite being an FBSU and was runner-up for the Pride of SWAC Trophy. He also holds the highest flying instructional category in the IAF and was handpicked to establish the ‘IAF Training Team’ abroad. The Air Marshal has the distinction of having held a number of significant staff appointments at Operational Commands, Joint Training Establishments and Air Headquarters. The appointments include Director Targeting Cell at Air Headquarters, Director Fighter Operations & War Planning at Headquarters Western Air Command, Assistant Chief of Air Staff (Intelligence) at Air Headquarters, Senior Air Staff Officer of two Operational Commands (Eastern and Western) and Air Officer Commanding-in-Chief of South Western Air Command. He is presently the Vice Chief of the Air Staff of the Indian Air Force. During his staff tenure, he developed the aerial targeting philosophy against our potential adversaries and transformed the concepts of Air Operations of the Indian Air Force to contemporary war fighting practices of Air Power. The success of performance of IAF units during international exercises in United Kingdom and United States of America under his tenure as VCAS is evident by the fact that all aircraft travelled half way across the globe and still maintained 100% serviceability throughout the exercise. The Air Marshal is also an avid reader and writer of Air Power and Joint Operations. He has held the appointments of Senior Instructor (Air) and Chief Instructor (Air) at the prestigious Defence Services Staff College, Wellington. In recognition for his meritorious Services he was awarded Yudh Seva Medal (YSM) & Vayusena Medal (VM) in 1999 and Ati Vishisht Seva Medal (AVSM) in 2015 by the President of India. He was appointed Honorary ADC to the President of India on 01 Aug 15 and awarded Param Vishisht Seva Medal (PVSM) in 2016 by the President of India.